I may be a bit behind on the Amouage-front, but I still cannot believe that the time has come (and now passed) for the house to launch their annual pair of fragrances. Last year’s duo, Fate Woman and Fate Man, were definitely a divisive pair, with some perfume lovers falling madly in love with the scents and others finding themselves not too impressed. My feelings were somewhere in the middle of this spectrum, seeing them as high quality outings, but perhaps not the most stimulating offerings from such a dynamic brand. This year Amouage is launching Journey Woman and Journey Man, two perfumes inspired by “Shanghai deco, Chinese cinema and film noir” and for the first time, housed in striking two-tone bottles of rich red and gold. These new fragrances mark the end of the first cycle of the Amouage narrative and as much as they smell like Amouage fragrances, they don’t appear to be as noticeably bold as the perfumes that have proceeded them. Journey Woman and Journey Man mark a change in the Amouage aesthetic, not only with the two-toned bottles, but also with their fragrant signatures, both of which are unusual takes on the house’s staple oriental opulence. With this new duo, Amouage moves forward into unchartered territory, speaking in the language of subtlety and scenting the air with an understated sense of panache. Upon first sniff, one expects an Amouage perfume, especially the female of the species, to come forth in a cloud of opulence, glamour and most notably – drama. Journey Woman however, is striking because of its softness, supple feel, and dare I say, subtlety. That’s right folks, this Amouage is not a fierce glamazon pounding the runway (see Gold Woman), nor is it an ethereal witch clad entirely in black robes (see Memoir Woman). No, Journey Woman is chic, contemporary and understated. Journey Woman opens fruity, but unconventionally so. The fruit notes here are rich and honeyed, with the fresh, peachy tones of osmanthus melting into a gloriously orange soup of apricot and mandarin. There is an ever so subtle animalic undertone to the honey, which feels like a glistening, golden nectar – a sparkling sap that drips slowly and envelops the perfume’s fruit and floral notes. As a further extension of this animalic feel, Journey Woman’s heart is full of lithe folds of tanned leather. Where many of Amouage’s perfumes feel decidedly couture, like a one-off gown, the delicate use of leather in this one give the impression of a luxury accessory – more casual, yes but just as expertly crafted and much more versatile. This is a perfume for any outfit, any occasion and any day. In the base, Journey Woman comes full circle and displays more fruit in the form of a cherry-like and plummy dose of pipe tobacco. Mixed with a dry and spicy vanilla, and the almost barnyard-esque feel of dark brown leather. The clever trick here though, is the application of contrast between the fruity tobacco notes and the heavier, more resinous notes. The result is a sense of softness that brings a satisfying level of weight. Journey Woman is a beautiful, auburn-coloured perfume that has mastered the art of subtlety. It’s not a Grand Dame, as many Amouage feminines are, and it feels much more casual than many other offerings within the line, and this is exactly what makes it special. As you can tell, I’m rather taken with it and I think it will make a lovely compliment to the diva-esque nature of more demanding fragrances such as Gold Woman. Bravo, Amouage! I’ll admit that my tastes always seem more aligned with the feminine fragrances in Amouage’s stable, with Interlude Man and Memoir Man being the notable exceptions, so it’s with a touch of trepidation that I approach their new, masculine offerings. Journey Man may not be jumping straight on to my love-list, but it definitely strikes a chord and presents a more luminous side to the Amouage man. Journey Man opens fuzzy and unclear. A haze of citrus fruits and spices swirl together, creating a striking, almost-menthol effect. As the initial discord dies down, the citrus becomes abrasive and sour, in a pleasing way, allow for a smooth transition into the floral heart. Geranium plays a key part, bringing a green sense of freshness that amplifies the overall feeling of sharpness. The base contains a spray of hefty materials, all of which cement the airier floral and citrus notes. It’s not listed in the notes, but patchouli seems to play a prominent part, providing dry earth, whilst incense and leather bring conflicting mineral and animalic nuances. That fuzzy/sour quality carries right through to the end and serves as proof that a fragrance doesn’t need to be harmoniously balanced to smell good. Journey Man is a handsome and bold masculine. It manages to be both vibrant and deeply resinous all at once. Where Journey Woman was a surprise and is easily the star of the duo, Journey Man is more subtle – a slow burner that invites one in with its unusual, yet incredibly palatable discord. I won’t be running out to buy it, but I certainly appreciate its intriguing sense of style. 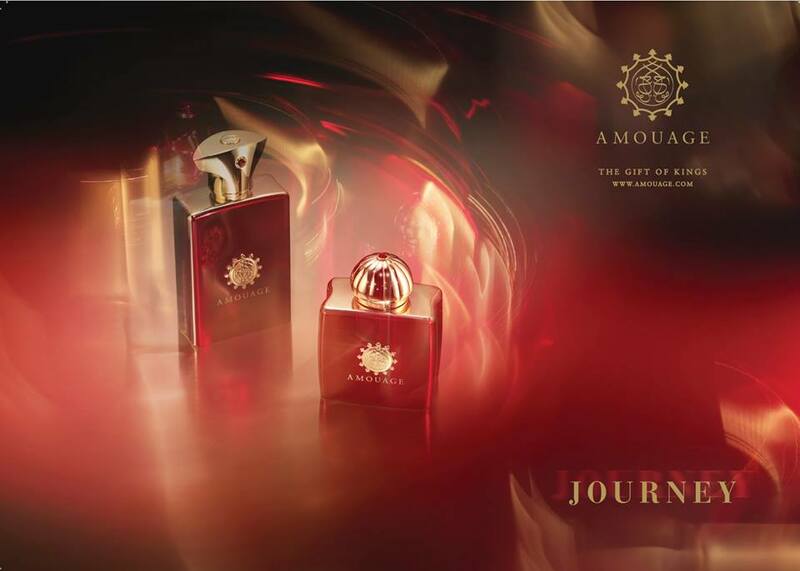 Amouage’s Journey Woman and Journey Man are available in 50ml and 100ml Eau de Parfum. Samples, images and notes via Amouage. Quote via cafleurbon.com. Posted in Amouage, Feminine, Floral, Fruity, Masculine, Oriental, Perfume Reviews, Woody and tagged Amouage, Christopher Chong, Journey, Journey Man, Journey Woman, Oriental, Perfume, Perfume Review. Bookmark the permalink. I had been expecting a light jasmine tea scent when I tried this last week (more fool me!) and was surprised how fruity and honeyed it was. This was just down to my erroneous expectations though. It’s certainly less grand than others in the line. I think I’d need a little time to get to grips with it. Amouage perfumes deserve more than a quick sniff on paper! Journey Woman really wasn’t what I expected either. It’s quite unusual for Amouage.